Prof. Drubin is currently based at the UC Berkeley where he is the Co-Chair of the Department of Molecular and Cell Biology, Ernette Comby Chair in Microbiology and Professor of Cell and Developmental Biology. He runs a joint lab with Prof. Georjana Barnes and their group is interested in the molecular mechanisms that underlie highly dynamic actin-mediated membrane trafficking events. Prof. Drubin was a biochemistry undergraduate student in UC Berkeley when he did research with Prof. Michael Chamberlin. For his graduate studies, he attended UC San Francisco and completed his PhD in Prof. Marc Kirschner’s lab. He then joined Prof. David Botstein’s lab in Massachusetts Institute of Technology as a Helen Hay Whitney postdoctoral fellow. He returned to UC Berkeley as an assistant professor in 1988. 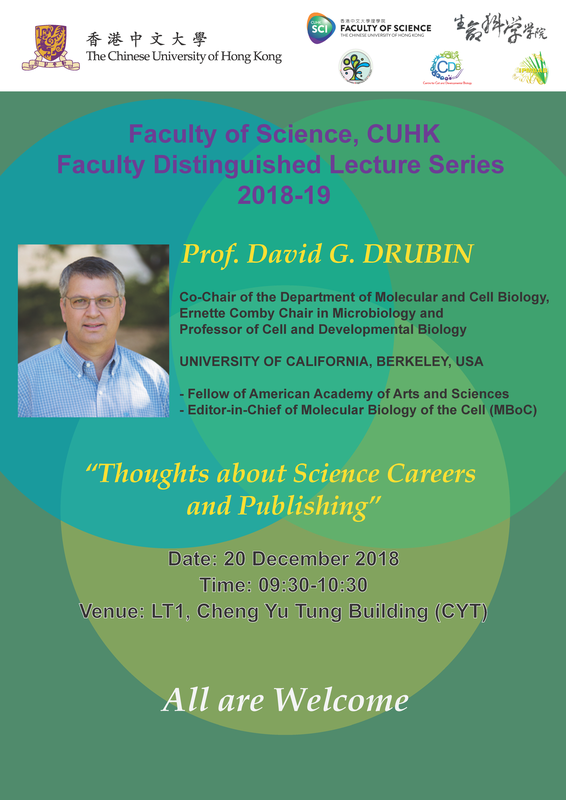 Prof. Drubin has received several prestigious awards including being elected as the American Academician of Arts and Sciences (2010) and more recently he was elected as the Lifetime Achievement Fellow of the American Society for Cell Biology (2016). He has been the Editor-in-Chief of the journal Molecular Biology of the Cell since 2010. Prof. Fan received his Ph.D. in Statistics from the University of California, Berkeley in 1989. He was then appointed as Assistant, Associate, and Full Professor at the University of North Carolina at Chapel Hill. Later, he became the Professor of the University of California, Los Angeles and then Professor and Chairman of Department of Statistics of The Chinese University of Hong Kong from 2000 to 2003. He joined Princeton University in 2003, where he is currently Frederick L. Moore '18 Professor of Finance, Professor of Statistics, and Professor of Operations Research and Financial Engineering. 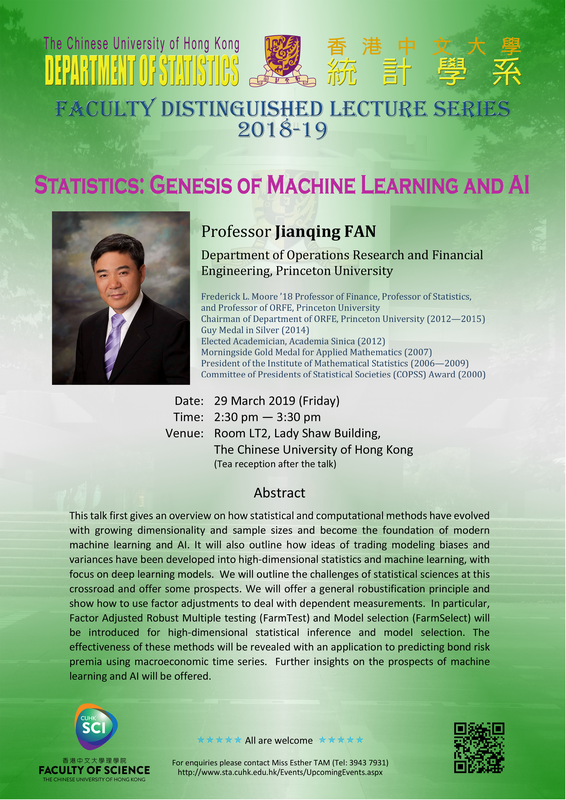 Prof. Fan’s research interests are in statistical theory and methods in data science, statistical machine learning, finance, economics, computational biology, biostatistics, high-dimensional statistics, nonparametric modeling, longitudinal and functional data analysis, nonlinear time series, wavelets and so forth. Prof. Fan received numerous prestigious awards including the Presidents' Award given by the Committee of Presidents of Statistical Societies, the Humboldt Research Award for lifetime achievement, the Morningside Gold Medal of Applied Mathematics, the Pao-Lu Hsu Award by the International Chinese Statistical Association and the Guy Medal in Silver by the Royal Statistical Society. He was an invited speaker at the 2006 International Congress for Mathematicians. He is a Fellow of the American Association for the Advancement of Science, the Institute of Mathematical Statistics, and the American Statistical Association. He was elected as Academician from Academia Sinica in 2012. Prof. Fu was born in Galion, Ohio, in 1963. He received his B.S. degree in 1985 from MIT, where he worked in the laboratory of Prof. K. Barry Sharpless. After earning a Ph.D. from Harvard in 1991 under the guidance of Prof. David A. Evans, Prof. Fu spent two years as a postdoctoral fellow with Prof. Robert H. Grubbs at Caltech. In 1993, he returned to MIT, where he served as a member of the faculty from 1993–2012. 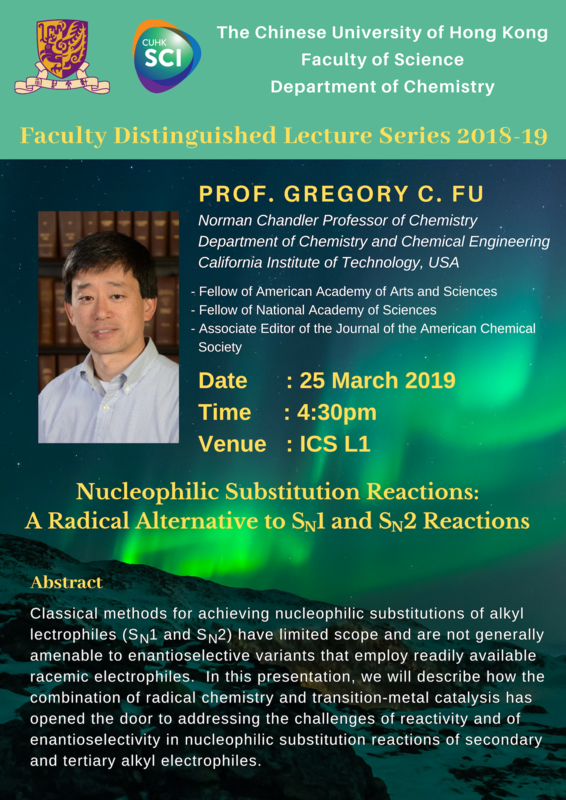 In 2012, he was appointed the Altair Professor of Chemistry at the California Institute of Technology; he has been the Norman Chandler Professor of Chemistry since 2016. Prof. Fu received the Springer Award in Organometallic Chemistry in 2001, the Corey Award of the American Chemical Society in 2004, the Mukaiyama Award of the Society of Synthetic Organic Chemistry of Japan in 2006, and the Award for Creative Work in Synthetic Organic Chemistry of the American Chemical Society in 2012. He is a Fellow of the American Academy of Arts and Sciences, the National Academy of Sciences, and the Associate Editor of Journal of the American Chemical Society. His current research interests include copper catalysis and nickel catalysis. Prof. Jones was born in Philadelphia, Pennsylvania, in 1953, and was inspired to work in inorganic chemistry as an undergraduate researcher with Mark S. Wrighton at Massachusetts Institute of Technology (BS, 1975). He obtained a Ph.D. in Chemistry at California Institute of Technology (1979), working with Robert G. Bergman and completing his final year at Berkeley. He moved to the University of Wisconsin as an NSF postdoctoral fellow with 2004 ACS President Chuck Casey, and in 1980 accepted a position as Assistant Professor at the University of Rochester. He was promoted to Associate Professor in 1984 and Professor in 1987, and is now the Charles F. Houghton Professor of Chemistry. Prof. Jones has received several awards, the most recent ones include the ACS Award in Organometallic Chemistry (2003), an ACS Cope Scholar Award (2009) and the Organometallic Chemistry Award of RSC (2017). He is a Fellow of the American Association for the Advancement of Science and the American Chemical Society. He also has served as an Associate Editor for Journal of the American Chemical Society. since 2003. 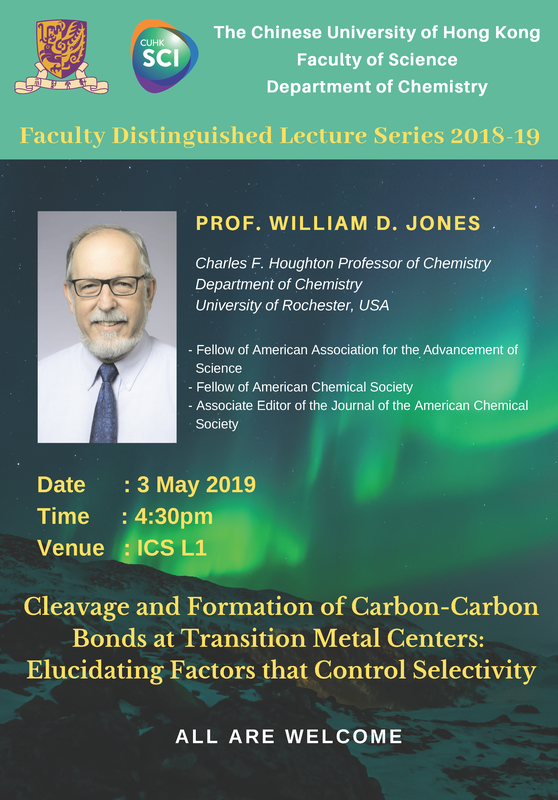 Prof. Jones' research interests include organometallic research in strong C-X bond cleavage, catalysis, model studies, mechanisms, kinetics, thermodynamics, and synthetic applications. Prof. Kajita's almae matres include Saitama University (B.S.) and University of Tokyo (M.S., Ph.D.) where his advisor was the 2002 Nobel Physics Laureate, Masatoshi Koshiba. Since 1988 Prof. Kajita has been at the Institute for Cosmic Radiation Research, University of Tokyo, where he became an Assistant Professor in 1992, then Professor and Director in 1999. Prof. Kajita's team at the Super-Kamiokande helped to prove the existence of neutrino oscillation and that neutrinos have mass. For this discovery, Prof. Kajita shared the 2015 Nobel Prize in Physics with Canadian physicist Arthur McDonald. Kajita's and McDonald's work solved the longstanding Solar neutrino problem, which was a major discrepancy between the predicted and measured Solar neutrino fluxes, and indicated that the Standard Model, which required neutrinos to be massless, had weaknesses. Prof. Kajita is currently the principal investigator of a kilometer-scale interferometric gravitational-wave detector located at the Kamioka Observatory, namely the KAGRA gravitational wave detector. This detector is expected to become operational in 2019 and will pioneer components that are cryogenically cooled to reduce thermal noise. The inclusion of KAGRA to the world-wide network will improve our understanding of cataclysmic events by enhancing our ability to find electromagnetic counterparts to gravitational-wave detections. Prof. Leong is currently the Samuel Y. Sheng Professor of Biomedical Engineering at Columbia University. He received his undergraduate degree in Chemical Engineering from the University of California, Santa Barbara and his Ph.D. from the University of Pennsylvania. After his postdoctoral training at MIT with Prof. Robert Langer, he joined the Department of Biomedical Engineering at The Johns Hopkins School of Medicine. After serving as a faculty at Johns Hopkins for almost 20 years, he moved to Duke University in 2006 and spent almost 10 years there to focus on understanding and exploiting the interactions of cells with nanostructures for therapeutic applications. Prof. Leong is a pioneer in developing multifunctional nanoscale technologies for delivering drugs, antigens, proteins, siRNA, and DNA to cells. He has published about 280 peer-reviewed research manuscripts and owns more than 50 issued patents. In 2013, he was elected a Member of both the USA National Academy of Engineering and the USA National Academy of Inventors. 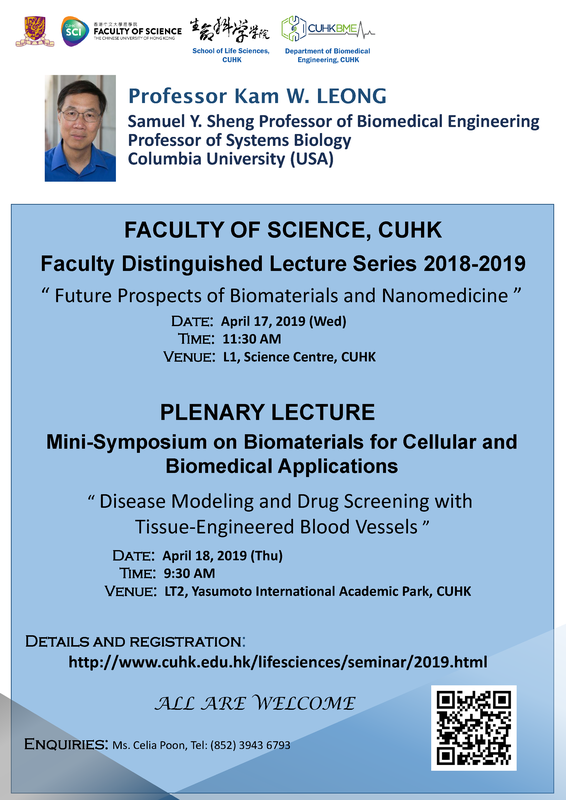 His work has been recognized by Young Investigator Research Achievement Award of the Controlled Release Society, Distinguished Scientist Award of the International Journal of Nanomedicine, and Clemson Award for Applied Research of the Society for Biomaterials. He is also the Editor-in-Chief of Biomaterials. Dr. Leung is a Battelle Fellow at U.S. Department of Energy (DOE) Pacific Northwest National Laboratory and an Affiliate Scientist at National Center for Atmospheric Research. Her research broadly cuts across multiple areas in modeling and analysis of climate and water cycle including orographic processes, monsoon climate, climate extremes, land surface processes, land-atmosphere interactions, and aerosol-cloud interactions. Dr. Leung is the Chief Scientist of DOE’s Energy Exascale Earth System Model (E3SM), a project involving over 100 scientists across eight DOE multi-disciplinary national laboratories and university collaborators. She has served on advisory panels and National Research Council committee that define future priorities in climate modeling. Dr. Leung is an elected member of the National Academy of Engineering and the Washington State Academy of Sciences. She is also a fellow of the American Association for the Advancement of Science (AAAS), American Geophysical Union (AGU), and American Meteorological Society (AMS). She received a B.S. in Physics and Statistics from The Chinese University of Hong Kong and a M.S. and Ph.D. in Atmospheric Sciences from Texas A&M University. She has published over 280 peer-reviewed journal articles. Prof. Siegmund earned his bachelor’s degree from Southern Methodist University in 1963, and his doctorate from Columbia University in 1966 and stayed there as Assistant Professor. In 1976, he moved to Stanford and attained the John D. and Sigrid Banks Professorship in 2002. He has twice been Chairman of Stanford’s Department of Statistics, and from 1993 to 1996 served as Associate Dean of Stanford’s School of Humanities and Sciences. He also held visiting positions at the University of Oxford and the University of Cambridge. In 2002, he was elected to the National Academy of Sciences, Applied Mathematical Sciences section and he is also a member of American Academy of Arts and Sciences. Prof. Siegmund’s research interests include probability theory, sequential analysis, sequential clinical trials analysis, statistical aspects of genetic mapping, desirable quantitative traits plants and domestic livestock. He tried to open up a discourse between theoreticians and clinical researchers. Prof. Siegmund has been awarded numerous honours and accolades including Woodrow Wilson Fellow, Danforth Fellow, NSF Postdoctoral Fellow, Guggenheim Fellow, Dean’s Award for Teaching, Humboldt’s Prize, Einstein and Fullbright Fellowships, and several other prestigious lectureships. Prof. Xue received his B.Sc. from Shandong University in 1984, and Ph.D. degree in condensed matter physics from Institute of Physics, the Chinese Academy of Sciences (CAS) in 1994. From 1994 to 2000, he worked as a Research Associate at IMR, Tohoku University, Japan and a visiting Assistant Professor at Department of Physics, North Carolina State University, USA. He became a Professor at Institute of Physics, CAS in 1999. He was elected as a member of The Chinese Academy of Sciences in 2005. Since 2005, he has been a Professor of Department of Physics, Tsinghua University. From 2010 to 2013, he was the Chair of Department of Physics and the Dean of School of Sciences. He became the Vice President for Research of Tsinghua University in 2013 and the President of Beijing Academy of Quantum Information Sciences in 2017. He won the TWAS Prize in Physics in 2010 and the inaugural Future Science Prize for Physical Sciences in 2016. His research interests include scanning tunneling microcopy/spectroscopy, molecular beam epitaxy, low-dimensional and interface-related superconductivity, topological insulators, and quantum size effects in low-dimensional systems. He has authored/coauthored about 500 papers and presented more than 150 invited/keynote/plenary talks at international meetings/conferences. Currently, he is the Associate Editor of National Science Review, the Editors-in-Chief of Surface Review & Letters, and on the Editorial Board of Applied Physics Letters, Journal of Applied Physics, Surface Science Reports and AIP Advance. Prof. Yau is one of the most influential contemporary Mathematicians. He is now Distinguished Professor-at-Large and Director of The Institute of Mathematical Sciences (IMS) at The Chinese University of Hong Kong, as well as William Casper Graustein Professor of Mathematics at Harvard University. In 1969, he graduated from the Department of Mathematics, Chung Chi College, The Chinese University of Hong Kong, and was then admitted to UC Berkeley where he completed his PhD degree two years later under the supervision of Prof. Chern Shiing-shen. He taught at the Institute for Advanced Study of Princeton, Stanford University, Stony Brook University, and University of California, San Diego. He has been a faculty member at Harvard since 1987. Professor Yau initiated the development of Mathematics in China. He led a number of research institutes in China, including Hong Kong where he grew up, for research and nurturing young mathematicians. He strived for research in Mathematics for 40 years and has received numerous awards and honours. At his age of 33, he was granted the Fields Medal, which was regarded as the Nobel Prize in Mathematics. He continued to be recognized via the Veblen Prize in Geometry (1981), the MacArthur Fellowship (1985), the Crafoord Prize (1994) and the US National Medal of Science (1997). In 2010, Professor Yau received the Wolf Prize in Mathematics in recognition of his lifetime contribution to geometric analysis, and his enormous impact on many areas of geometry and physics. Recently, Prof. Yau has been honoured with the Marcel Grossmann Award.